This evening was SF Tarot Cafe at Borderlands Cafe and it was my turn to lead this evening’s discussion. I had everyone pick an Angel Card and then choose a card or two that best fits with the word they chose from their own tarot decks. Once everyone had a chance to decide, we all discussed our word as well as what card we felt worked with it. My word was Purpose and I used the Druid Craft deck . I chose the High Priestess and Temperance to represent Purpose. Other words that were chosen were Abundance, Exploration, Openness, and Peace. Each person used their own decks to share their ideas of the cards that represented their idea of their word. Exploration was represented by The Fool from the Thoth deck as well as The Star and The Universe Card. Openness was seen as the 3 of Swords and The Fool as well as The Lovers from Rider Waite Smith deck. Peace was seen as the Queen of Pentacles from The Tarot of Marseilles. Abundance was seen as Ten of Pentacles and Queen of Wands in the Tarot of the New Vision. Each person explained why they chose the cards and how they would use the cards to explain this to their querents. Next we broke up into pairs and picked a new work to use our decks to describe the word. The chosen words were Support, Delight and Flexibility. The Support group used the Thoth and Tarot of the New Vision to show what cards work for them. The Delight group used Tarot of Marseilles and Rider Wait Smith. I used Druid Craft to describe Flexibility. The cards I used were The Devil, The Hanged Man,8 of Wands, 5 of Wands and 2 of Pentacles to talk about Flexibility. I liked the idea that the Devil was one has to be flexible in not jumping to conclusions and not trying to avoid taking responsibility for one’s actions. The Hanged man reminds us to be flexible in our views and relax when we get stuck in a rut. 8 of Wands reminds us to be flexible in what we try and not avoid trying new things. 5 of Wands is for being flexible in a group while 2 of Pentacles reminds us to be flexible in how we see our situations and reminds us to find balance as well. At the end I asked everyone to pick a Fractal Card from my Voyager Tarot Fractal deck. The cards that were chosen were as follows: The Lovers, Child of Cups, Man of Worlds, and Child of Crystals. Each person said this was exactly where they thought they were and would see how they could apply this message to their week. I think we all enjoyed sharing another l;ayer to add to our readings and new keywords to think of our own cards and sharing them in readings for ourselves and others. The next SF Tarot Cafe will be Tuesday, May 18, 2010. I hope to see you there. I had picked up the 2006 Tarot Calendar featuring Arnell Ando and Leslie Cochran collage tarot cards at SF BATS in 2008. Even thought the calendar part was not relevant any more, the pictures were amazing. I cut them out and put them up in my office to inspire me with my work. I was able to meet Arnell Ando at the 2009 SF BATS when she gave a talk about Tarot and Art and throwing Tarot themed parties. She shared some amazing art she had created such as her Tarot Mirrors and Tarot Masks. 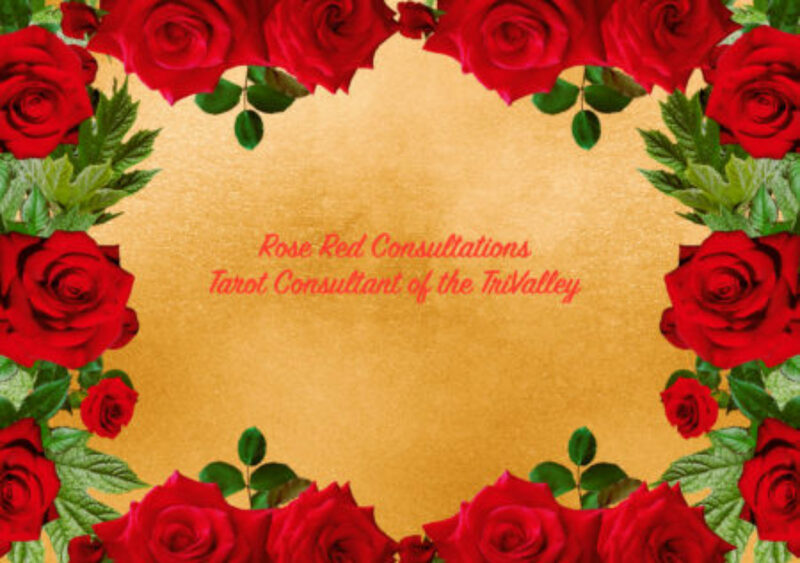 She shared with us ideas about how to make tarot themed invitations as well as activities to enjoy. She also shared with us music that inspired her art. I loved the use of the old fashioned type writer and typed message coming out of it. It expressed how I think of Death, being free of the body and able to be free from the conventional ties to one’s memories no longer. When it is time to go, I hope it will be like floating away from this plane. I like the image of the mask coming away and freeing one from the Ego. I looked through the other cards and found the one that was hanging above my desk at eye level so I could look at it whenever I am feeling low: The Wheel of Fortune. As I read through the accompanying book, Arnell had made sure to show the many different ways one could gain information about one’s future fortune, with a Magic 8 Ball, playing cards,a crystal ball, a wheel of fortune and of course tarot cards. Madame Fortuna challenges one to decide if they will take a chance of giving up what they have for what could be. And anything can occur if one take a spin at the wheel. The next card that caught my attention was The Moon. I often get this card and thought that the two towers made from interesting blocks Arnell had made herself was just another layer she added to this card showing her personal style. The Moon, winking in the center of the card, seemed to be showing the playfulness that can be found in the moonlight. The two wolves in the picture also show the wild nature that can come out during a full moon, with one howling and the other seeming to invite the viewer to explore their own wild side. And of course the two Lovers cards intrigued me. This card shows many different ways of expressing love. It implies a simpler and gentler time. There are many types of couples in this card. They show romantic love as well as camaraderie between each other. I felt like this card could come up in a reading about love between couples but also as friendships and relationships between family members and siblings. The Wolfman has his feet in the waters of Venice clutching two love letters from the two women in his life. One of these ladies is depicted as a masked woman with a voodoo doll and the other as a beauty preparing for a visit with her love. These two women represent the Wolfman’s choices in his world between mystery and beauty according to the artist. I see this card as one that warns of the fickleness of love. It also caution one of the hidden motives of misguided lovers. It can warn of a relationship that is not completely as it seems. The rest of the cards are just as lovely and hold many different views of the way to explore each of the Major Arcana cards. I am in awe with the art, thought and work Arnell put into each of the cards. I find that I see new things each time I pick them up. As I work with The Lucky Pack more, I will post what it reveals to me. We lay on the table? Where our answers are found. Of the vagaries of chance. From when we were young? When I first began exploring Tarot Cards, I decided to have a reading from a friend who was using the Rider-Waite-Smith(RWS) deck. I got the Ten of Cups as my final outcome card in a Celtic Cross spread. She said that this was a great card and things were going to be fabulous in the future. I saw the beautiful cups and the rainbow and thought “It is a lovely scene, but what do those children dancing in the bottom mean? I don’t have kids and just got divorced.” I wondered what it could mean. What had Pamela Coleman Smith drawn and what message was being conveyed? Why was it that way? You can’t see the couples’ faces, only the “happy” children dancing up a storm under a rainbow full of cups. In the book that accompanies the Original Rider Waite Tarot Deck, The Pictorial Key to the Tarot, Arthur E. Waite stated that the Ten of Cups shows an “appearance of cups in a rainbow; it is contemplated in wonder and ecstasy by a man and woman, evidently husband and wife.” But I was not sure how this applied to me and my situation. I started to look at other decks and how other Tarot artists viewed this card. I started with the Ten of Cups in the Voyager Tarot deck by James Wanless, which shows the Ten as a golden cup surrounded by flowers. The cup is a golden lion with flowers coming out of it and all the flowers are in full bloom. It appears to be abundance in all it’s glory. In the Halloween Tarot, the Ten of Cups is depicted as the Ten of Ghosts and all the Ghosts are strung around the card as decorations at a party. The full moon is shining down on the couple in the card as well as the two little children who seem to be dancing in the bottom corner of the card. In the Archaeon Tarot, the Ten of Cups appears as a Geisha standing by a darkened wood with ten cups arranged on the ground before her. Her demeanor seems pensive and the woods foreboding. It became clear to me that every artist had taken a differing view of ways to express this last card of the Cups suit. But how should one read this overflow of emotions? As I continued my studies, I found out that Tens are the extreme of the Minor Arcana. They represent as far in the suit as one can go and this can be both good and bad. This water card is at the end of the cup pips. It represents having been through all the other places and it is now at the end of it’s journey. It is the final cups card before you go into the court or cycle back through the pips. It stands ready to be the answer to all and yet the last question in the emotion cards. Cups are the element of water with it’s ebb and flow. When looking at the other pip cup cards, the Ten stands out as it doesn’t appear to have water in its cups in the RWS deck. It is encompassed in the rainbow after the flood. Could it suggest that one has to survive the floods of emotions to reach one’s rainbow or emotional dreams? Traditionally, the Ten of Cups is seen as the overflowing of emotions or having achieved the end of the journey in the Cups. But when it is laid in different positions in a spread, it is interesting to see how the position effects the meaning of this card. If one focuses on the location of the card in the spread instead of just using the main meaning of the card as the deciding factor of its message, the reader can really expand what this card could be conveying to the querant. In other words, try applying the meaning of the location in the spread to give perspective on the possibly meaning of the card in that location. For example, when it appears in the hopes/fear position in a Celtic Cross spread, how often does a reader skim it as “Oh see you hope for a family and complete joy“? Why not also consider it as fear of never having a family or kids? Or what about the obsession with finding the “perfect mate and family” and not looking at how the querent can improve themselves to meet the lofty goals as promised by the Ten of Cups? What other meanings could be seen here? What if you hate rainbows? It could be seen as no more rain, but it could also be seen as no more water to help things grow. In the different positions in the Celtic Cross spread, one might want to add that position meaning to the wonder of abundance in the Ten of Cups. Another example is using a 3 card spread of Past, Present, and Future. As the Ten of Cups moves through each position, how can it change how it is viewed? When it appears in the Past position, it can imply having a good foundation to have built upon. When in the Present position, it could imply having achieved your goals in your job or family life. Finally, when in the Future position it could be considered to represent a goal one is working towards or rejoicing the good time one has worked hard to achieve. Try it in a spread you have not used before and you can see even more depth to this card. Each spread position can effect how the reader can take the meanings of the Ten of Cups and express it for the querent. Of course there could be a meaning of negativity one might need to consider for different querents. Upon looking at the the Ten of Cups, one can’t see the faces of the two “adults” in the scene in the RWS card. The woman could be screaming, crying or weeping because she is being held captive by the man who has his arm around her waist. He could be keeping her there as he points up to the sky saying “See, you are mine. Even the heavens say it is so.” The children could very well just be evil henchmen dancing as their master has captured the princess. It depends on the querent and what they see as well. Or perhaps this ‘ideal’ setting is exactly what the querent doesn’t want, having recently escaped a restrictive relationship or household and now is on their own; in this case it represents what they got away from. It could be that they feel that everyone around then is telling they must get married and have children and that isn’t their ideal. The Ten of Cups can imply dependency; that only in partnership can ‘happiness’ be found. For some people, this is exactly what they should NOT be seeking at this point in their lives; someone with a co-dependency problem may see this card as vindication of their habits and self-harming nature. Again, it depends on who the reading is for and the question at hand. On the other hand, perhaps the Ten is a goal but hints that trust, partnership and occasionally letting someone else handle things is needed. Not exactly what a Type-A, dominant, control-freak wants to hear, but maybe what they need to hear. The Ten of Cups, like every card, can contain bitter and necessary truths under the guise of idyllic rainbows. I have found that the meaning of the Ten of Cups -and all cards for that matter- changes with the position I find the card in, for every reading I do. When the Ten of Cups is in the beginning and it cross the first card, generally people are looking for the rainbow of their dreams. When it showed up in the past influences, it could be about letting go of old dreams that weren’t their own. When it comes up in the future influences, it is more about looking for their own view of happiness. If it is in the hopes/ fears position it is sometimes the hope for a family and children. It also represents the fear of never finding that ideal. Each reading brings on a new way to see the Ten of Cups. And each placement is a correct way to view the Ten of Cups. It is what the querent needs it to be. And the Ten of Cups, like the water it represents, ebbs and flows as it shows up in any reading. It was a wonderful evening at the SF Tarot Cafe this week. We had 12 people attend so there were plenty of new faces to expand the fun. We had Nina, Fey, Simone, RJ, Sarah, Susa, Marianna, Anastasia, Andrew, Camille,Roxanne, and myself. Anastasia opened the discussion this time talking about the Pentacles or Coins or Worlds as James Wanless calls them. She shared her information about how when we see the Pentacles come up in a reading generally it points towards money issues. She asked us to share with the group other things we as readers see or what else comes up when pentacles are present in a reading. Some said jobs, family, possessions not just money, home, and earth in general. We also talked about how the Pentacles also reflect the The Wheel of Fortune in the Major Arcana. The Wheel of Fortune can be seen as a large Pentacle. It is an example of how things move in cycles as you can see through the Pentacles suit. We then broke into pairs and did a two card reading for each other, having pulled out all the pentacles for the deck. After the reading we then were asked to chose a Pentacle card to help move the person forward towards their next action. Then the querant is to choose their own Pentacle for what they thing they need to do next. I worked with Sarah. I used the Archeon Tarot this time. I chose the Knight of Wands and the Six of Cups. Sarah said that the knight was representative of change but not happening right away. But that the person is chomping at the bit if you will. The Six of Cups shows up as the contact from past friends coming back into your life. Next Sarah chose the Ace of Pentacles as the next step to take as getting clear what yu need to do and get settled and make a clear choice for myself. I chose the Two of Pentacles for myself as I need to find my balance between what I want to do and moving forward as well as incorporating my past into my life. It was a good way to look at the Pentacles even if it was a little unnerving to choose a card intentionally for the next step to take after a two card reading. SF Tarot Cafe is happening at Borderlands Cafe! Hope to see you there!